U.S. drones and aircraft have begun arriving at an airbase in southern Turkey, the country's foreign minister said Wednesday, ahead of the launch of a planned effort to clear Islamic State militants from an area of Syria across the Turkish border. Mevlut Cavusoglu said Turkey and the U.S. would soon "start an extensive battle" against the Islamic State group, leading to safer conditions for moderate opposition forces who are fighting the militants. "Now we are training and equipping the moderate [Syrian] opposition together with the United States, and we will also start our fight against Daesh very effectively soon," Cavusoglu said, using the Arab acronym for the militant group. Turkey shares an 800-kilometer (500-mile) border with Syria, and a section of its southern frontier abuts directly with territory controlled by the Islamic State group. Officials have described the plan as an effort to create an "Islamic State-free zone" stretching about 100 kilometers in length in northern Syria. It would not include a no-fly zone in the region, despite longstanding demands by the Turkish government for one. Diplomats familiar with the plans told Reuters that cutting off the Islamic State group's access to the border, over which foreign fighters and supplies have flowed, could be a game changer. Washington said Tuesday it had indications some of the rebels trained by its military were captured by fighters from al-Qaida's Syria wing, Nusra Front. The group, thought to number less than 60, only deployed to the battlefield in recent weeks. The U.S. has been leading a coalition of countries conducting airstrikes against Islamic State targets in Syria since September of last year. 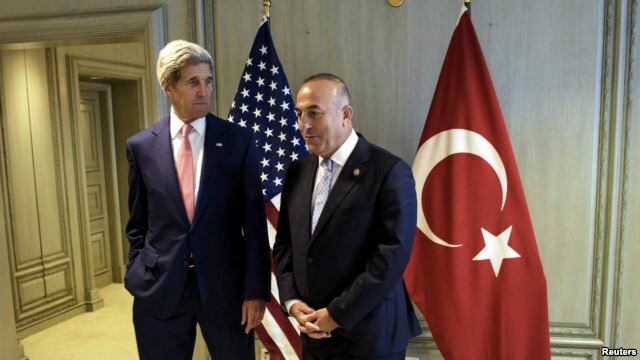 Cavusoglu spoke during a visit to Malaysia, where he met on the sidelines of a regional summit with U.S. Secretary of State John Kerry. 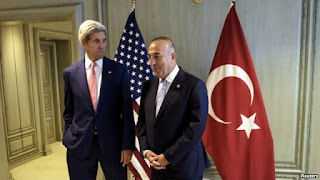 A senior State Department official summarized the meeting for reporters, saying Kerry "welcomed Turkey's recent decision to open its bases to US participation in air operations against [the Islamic State] and its support for Syrian refugees." "The secretary also reiterated U.S. commitment to promoting conditions for a negotiated settlement to end the conflict in Syria," the senior official said. Turkey agreed last month to let U.S. forces use the Incirlik air base near Turkey's southern border with Syria. Washington has been pushing historic ally Turkey to step up the fight against the Islamic State group, something Ankara had until recently been reluctant to do. That position changed after deadly attacks inside Turkey, some of which were blamed on Islamic State militants.